When it comes to picking the best WordPress hosting providers, there are a few web hosts that might come to mind. SiteGround WordPress Hosting is definitely one of them. While offering much more than just hosting WordPress sites, SiteGround has become a well known WordPress host and competes with the other top tier Web Hosting providers. In this web hosting review, we will look into the benefits that SiteGround can bring your online presence from a hosting perspective. We will deep dive into the performance, features, and tools available to SiteGround customers, WordPress users or not. A key factor for many customers is SiteGround’s ability to remain affordable considering all the features that they offer. Being able to offer a robust line of features and service while keeping prices competitive is the biggest challenge for most hosting providers. In this case, we believe that SiteGround web hosting has stood up to meet the challenge of an ever competitive market and to also push a very customer first approach in how they handle customer support, free features, and availability. SiteGround is more than just another web hosting company they are a online partner, committed to their customer’s success. 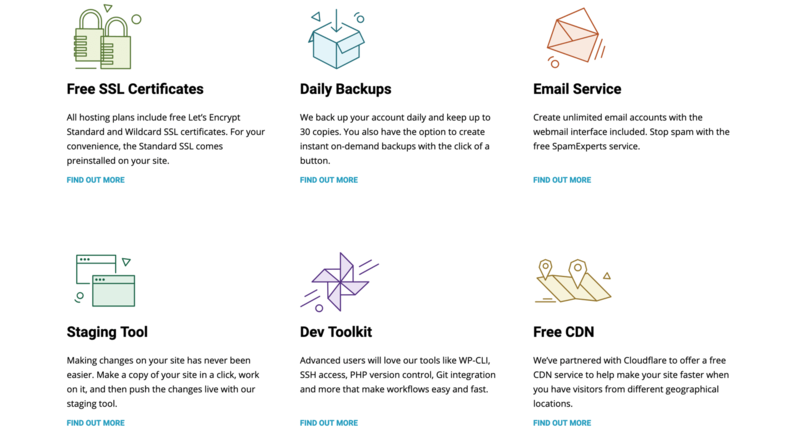 For their WordPress hosting customers, SiteGround leverages a number of performance enhancing features that better support the WordPress environment and mirror some of the functionality that we tend to expect from managed WordPress web hosting companies. These companies tend to charge a premium for these kinds of services, but at SiteGround it just part of the plan. The biggest performance enhancing feature that SiteGround offers to their customers is the use of Nginx dynamic caching and the utilization of performance tuned Memcache. While these options are not available in the lower tier of WordPress hosting (available in the GrowBig and GoGeek tiers), these service will greatly enhance the WordPress site load times by storing significant assets of your site in the server’s memory. This means that your site is able to load faster on the server-side which is important based WordPress is primarily a mix of PHP and other server-side programming languages. Additional features like g-zip compression, CSS&HTML minification, and automatic image optimization means that your site will have access and be pre-configured to operate in a very performance tuned environment that is designed to maximize speed and availability of your site. Putting SiteGround’s load speeds to the test while using the StartUP plan (no fancy caching), we scored an 88 selecting the closest available datacenter with a load time of 733MS. This score falls inline with our expectations for the test site load. Do keep in mind that your individual experience may be different. After all sites are not all the same and there are very many factors at play when determining a load speed avg. But a generally rule of thumb for the average WordPress site is under 1 second. If you intend to run 50+ plugins that dynamically change content frequently or to have a membership area with potentially hundreds of users signing in at the same time, you should expect a higher degree of variance based on the site usage. With the available caching and optimization options, SiteGround customers can expect solid load times and decent optimization metrics from most popular site analytics services like Pingdom, Page Insights, and GTmetrics. For this SiteGround hosting review, we fired up a quick load test a on WordPress site which revealed very optimistic results. In this load test we had the site being accessed by a 100 unique, concurrent visitors, spanning 10 different geographical locations in a 5 minute window. The SiteGround instance handled the stress test very well with new site load accesses during the stress test continuing to fully load at a little over 1 second. Again these kinds of results can vary depending on what your site specifically will need to for your unique visitor, but you can expect that the SiteGround’s servers to be configured and tuned to handle multiple simultaneous user accesses to your site. We would like to point out this stress test was implemented against the StartUP plan which is the most cost effective WordPress plan that they offer. 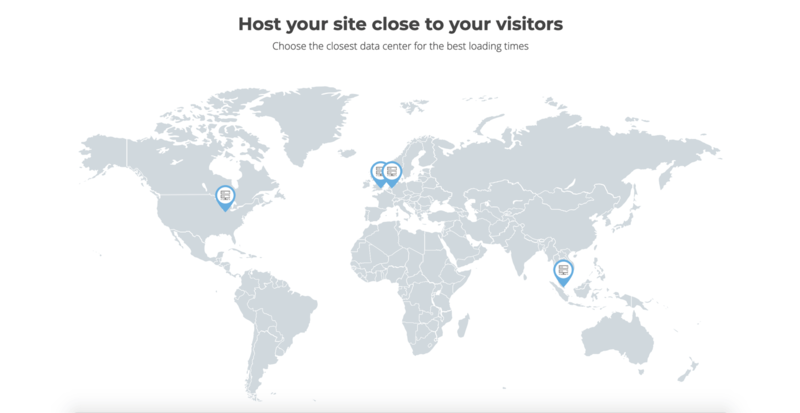 SiteGround offers hosting and CDN services across 4 data center locations, globally targeting three main geographical regions; North America, Europe, and Asia. Their datacenters are located in Chicago, US, London, UK, Amsterdam, NL, and Singapore, SG. On their site, in the technology menu you can view their datacenter map and use a pingable IP address for speed testing. Each one of these locations is designed for high availability utilization and has access multiple major telecom carriers, redundant electrical systems to keep servers running in the event of power failures, and data asset security measures including 24/7 surveillance, biometric entry/exits, round the clock security personnel. SiteGround boasts a 99.99% Network uptime guarantee by minimizing downtime events and leveraging pro-active server monitoring to not only repair issues but to prevent them from ever happening. To support their network uptime guarantee, SiteGround utilizes Linux containers (LXC) as a platform based for the elasticity, resource efficiency, and stability during traffic spikes. They pair this efficient platform with an anti-bot AI that works tirelessly to weed out brute force access attempts and to thwart botnet strikes. The anti-bot AI stops anywhere between 500,000 to 2,000,000 brute force attempts every hour. Separating their users accounts also allows SiteGround and their customers an additional layer of protection. In the shared environments the individual customer account are separate by another level of account separation which helps to keep issues affect one customer from spilling over and affecting other customers. That is a very common issue that affects many shared environments since the resources are shared between all accounts. SiteGround offers a simple to use click and install deployment method for their WordPress platform which will keep the tedious part of installing the WordPress core site files and database configuration out of sight. Once deployed you will have access to SiteGrounds custom WordPress launch which will provide you access to professional themes, online store fronts, Email forms, gallery and portfolios and much more. If you are needing to transfer your existing WordPress site from another host, SiteGround has you covered. They offer free access to their Migrator Plugin which will process the entire migration process for you while retaining your site configurations. If the Migrator Plugin option isn’t the best fit for you, they also offer professional migration services to move your site over manually if you are moving from a cPanel hosting provider. This migration will include your site and database files, email files, and add-on sites. And if further support is ever needed the SiteGround technical support staff is only a chat or support ticket away and can provide excellent service and insight for your hosting product. SiteGround offers a number of features for their customers that will help support the hosting environment and greatly enhance the customer experience. SiteGround maintains a 30-Day refund policy for their shared hosting services. If the service doesn’t meet the expectations outlined in the SiteGround TOS, you can quickly and easily submit your refund request through their 24/7 chat and ticket support systems. Growing in popularity, leveraging free SSL’s for shared services has become a staple for many hosting providers. Securing the web is in an important endeavour, but it is alway important to remember if you are selling products and achieve higher numbers of transactions that using free SSL services has drawbacks and it may be better to purchase an SSL that offers better features. For advanced users, SiteGround allows for jailed SSH session to run low impact CLI commands to interact with your site files and directories, output retrieval commands, and much more. If the previous host was a cPanel hosting account, they can migrate your email, ftp settings, and addon domains as well. The SiteGround features listed below are specific to WordPress or higher tier plan customers (GrowBig and GoGeek). 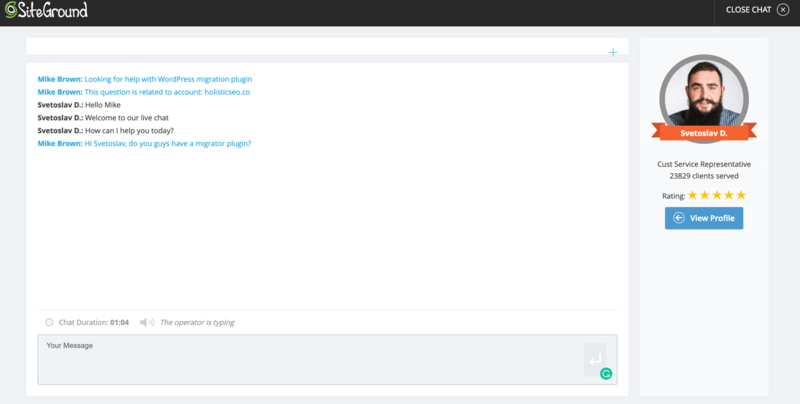 One of the best WordPress Migration tools available, the Migrator plugin is a free tool provided by SiteGround that allows their customers to quickly and efficiently migrate their WordPress websites to the SiteGround host. You can migrate as many sites as you need to using this method and if you are WordPress site owner, using this tool can save you quite a bit of money when compared to the transfer cost of a professional manual transfer. Daily backups of your site is the fast and most reliable way to restore a site from a malicious intrusion, poor implementation of a new plugin/tool, or other site breaking issue. SiteGround will take up to 30 copies of your site, meaning 30 days worth of backups that you will have access to use for site restoration. This feature is free for GrowBig or GoGeek plans, but will cost $29.95 for the StartUp plan to add on later. Available for SiteGround’s GoGeek plan only, this feature will allow developers a built-in method for Git deployment and repository creation for the websites they are developing. 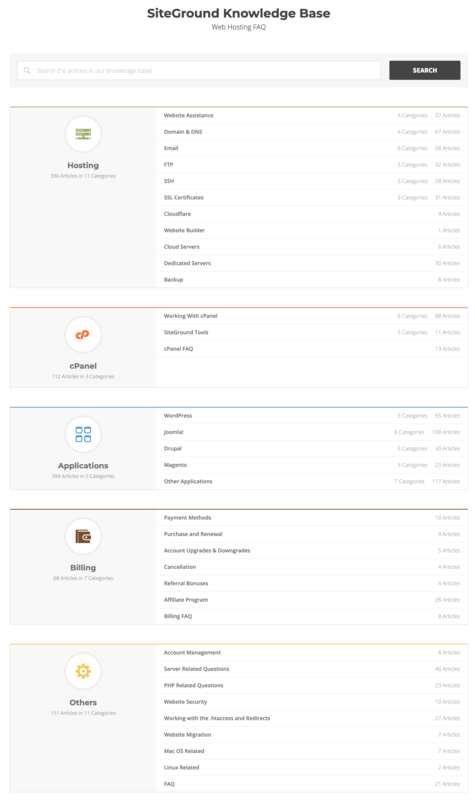 SiteGround has also created a visual GIT interface for popular CMS instances like WordPress, Joomla!, Magento, and Drupal. SiteGround’s Staging tool is a fantastic quality of life feature that many hosts tend to over look. Having the capacity to quickly spin up a copy of your site and apply changes to a web available instance of your site without affecting your live website instance is a godsend. While many hosts allow you to do this with their hosting plans, SiteGround has built a tool to make that process much more efficient. You or your developer will love being able to test things out with much less time involved for setup. Server caching by siteground comes in two methods. One is through static content caching like images and repetitiously used web assets and two is through dynamic caching leveraged by SiteGrounds “SG Optimizer plugin” which will connect your site to their Nginx and Memcache caching server to greatly speed up your WordPress or PHP based site. By being partnered with CloudFlare, SiteGround allows for free access to the Cloudflare CDN services for your site. This is a great feature for customers that target remote geographic locations to decrease load times in those regions. A CDN (content Delivery Network) distributes your site to multiple server locations across remote and local geographic regions. The primary benefit of deploying a CDN will be to decrease the time it takes for a remote visitor to load your site. It can take a couple seconds to load a site in London UK, from a server in Chicago USA. Deploying a CDN can allow you to “host” an instance in London UK for those visitors and decrease the amount of time it would take for that same visitor to load your site from the Chicago USA instance. SiteGround’s dashboard provides quick access to your account settings, extra services, installations, and their sitebuilder. Good customer service and strong technical support are the pillars of a great web hosting provider and SiteGround can deliver on both. Providing 24/7 chat and ticket support for technical issues and always on-line customer service team, SiteGround has you covered for whenever an issue may occur. Maintaining high customer satisfaction ratings is no easy task and SiteGround works diligently to ensure that their customers are well taken care. SiteGround offers three types of Shared Plans that use the same plan tier structure of StartUp, GrowBig, and GoGeek plans. This product is the best option for WordPress user needing shared hosting on the SiteGround infrastructure and unique WordPress features. This product works best for WordPress user that will be using their WordPress site as a WooCommerce Ecommerce site. SiteGrounds Cloud Hosting solutions are the next tier of hosting products. These options are VPS options that dedicated resources to a customer by provider a full server instance for the customer that is private to them. Entry: This is the 1st tier plan that offers a low-end VPS. A VPS with these kinds of resources would be best suited for development not production. Business: The mid-low tier option increases the VPS resources and would be a better options for a site going into product with a moderate amount of traffic. Business Plus: This plan is the mid-high tier option that will further increase the VPS resources and is the next step of upgrade for when traffic volume increases. Super Power: This is the highest tier Cloud Hosting Solution offering a large amount of dedicated resources and is the best value of cloud solution. There is no such thing as a “perfect host” and not every possible need can be catered to. In this SiteGround review we want to analyze the host for their best possible use case so that our readers can make the most informed decisions they can when selecting a hosting provider. Below are a few of things that we need readers should be aware of when making their decisions. While the pricing for the shared service is very competitive, there are a number of support features that can carry an additional cost that some other hosting providers will perform free of charge. A primary example is the professional website transfer. A lot of hosts will not charge to manually move 1 domain from a previous host to their own network and even if they do, the cost of the migration is well below $30. We generally see something in the tune of $10 per site for a domain transfer. Some hosts will offer to transfer between 1-2 domains for free then charge a migration fee if there are more sites to be moved. Another factor is the site backups. Most shared hosting providers allow for daily backups on all of their shared products not just the higher tier plans. In SiteGround’s case it will cost $29.95 to add daily backups to the StartUp plan. Obviously the better solution would be to upgrade to the next tiers GrowBig or GoGeek. So it is likely that the cost is there for aversion. To keep customers from wanting to stay on the StartUp plan if the need the backups. Another pricing gripe is SiteGrounds Cloud Hosting plans. The lower tiers are just not worth the cost for what you get in terms of resources. The Super Power plan is the best value at $240/mo but not every setup would require that amount of resources. The lack options for tailoring your hosting experience become more apparent the deeper you dive. SiteGround’s biggest limitation when compared to other hosts is lack of hosting solutions. This goes both ways, however. By restricting the number of products they offer, the ones that they do are very well received and well supported. But that will limit the number of customers that can properly utilize their services. SiteGround specializes in shared hosting products and provides an excellent environment to support those products. Where their limitations really begin to show is their dedicated Hosting solutions as there options are a bit restrictive and pricey. Do We Recommend SiteGround Hosting? For customers needing a solid shared WordPress hosting solution, there are few that can compare to SiteGround. We highly recommend SiteGround’s WordPress hosting options for anyone looking for the best WordPress hosting. 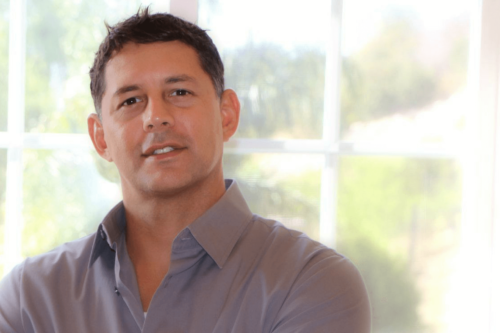 Their features are rich and intuitive and their support is knowledgeable and available. We wouldn’t recommend SiteGround for anyone needing a dedicated VPS unless the Super Power plan is something that you would need. The other plan options are really just too much for too little. Do I get a free domain with my SiteGround Hosting Account? No, SiteGround doesn’t offer free domain name registration. Yes, ordering hosting products and services is quick and easy. After I make a purchase with SiteGround when do I get access to my server? When purchasing shared hosting plan, your product will be ready pretty much immediately. If purchasing a Cloud Hosting plan there is small provisioning window before your product is ready for use. What methods of payment does SiteGround accept? SiteGround accepts VISA, MasterCard, American Express, Discover and PayPal. 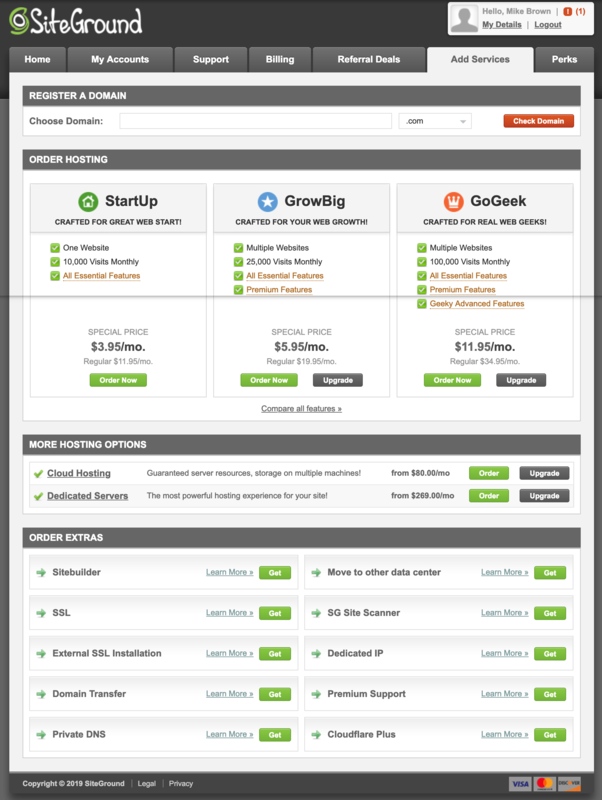 Yes, SiteGround allows you to quickly scale up your shared and cloud hosting products. There can be some limitations on downgrading a hosting plan though. These reasons can vary between customers. Does SiteGround put any advertising on my website with any of their hosting plans? Nope, SiteGround will not brand your website. Yes, your products and services will automatically renew according to your billing cycle. We always recommend to reach out to the customer service teams to see if there are ongoing promotions that you can take advantage of. Yes, SiteGround specialize in a few of these but most CMS options will be allowed on their hosting plans. SiteGround uses the cPanel/WHM platform for managing websites.